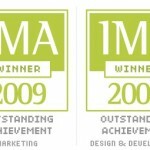 We just received notice that our new company website earned two IMA awards. Both are Outstanding Achievement awards, one for Marketing and one for Design & Development. Thanks go out to us and well…us.